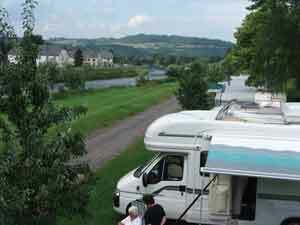 On all four of our visits to Luxembourg we stayed at Camping Grit on the banks of the River Sure. The site is rurally located at Ingledorf, midway between the towns of Ettlebruck and Diekirch. For those interested in miltary history, this area was the scene of fierce fighting in World War 11 as the many monuments in the area and the museum in Diekirch will testify to. The museum is well worth a visit although wheelchair access is limited. A cyleway runs between Ettlebruck and Diekirch along the river bank. These have been expanded making it even easier to visit the local facilities in Ingledorf itself or either town. It is a pleasant level walk/cycle of about 1-1/2 miles along the riverside to either town. Both have level pedestrian areas and neither is difficult to get around. Close by the camp site, no more than a 10 minute walk away, there is a very large modern Cactus Comercial Centre which includes the Cactus supermarket. It has parking and toilets for the disabled as does the supermarket in Diekirch. However we noticed, as in 2006, a leveling off in prices and whilst the cost of fuel remains one of the cheapest on the continent, other prices are now comparable to anywhere else within the EEC. For those who might wish to travel the 18 miles into the city of Luxembourg without a vehicle, there is a train service from Ettlebruck and Diekirch but we have never used it. There is also a bus service which runs along the opposite bank of the river to the site. Buses were not wheelchair friendly and while I did see some trains with a wheelchair symbol on specific coaches, this was not the case with every train.